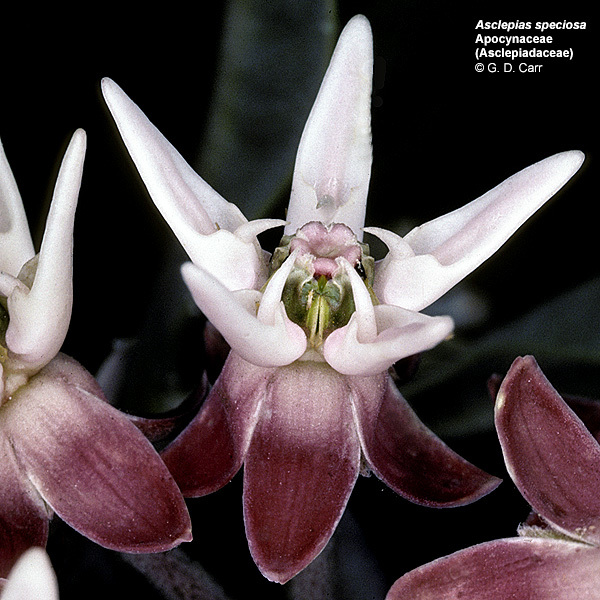 The Asclepiadaceae are mostly herbs and shrubs with white sap comprising about 250 genera and 2,000 species, many of which are lianous and some of which are cactuslike succulents with reduced leaves. The leaves are simple and nearly always opposite or whorled; minute stipules are present. 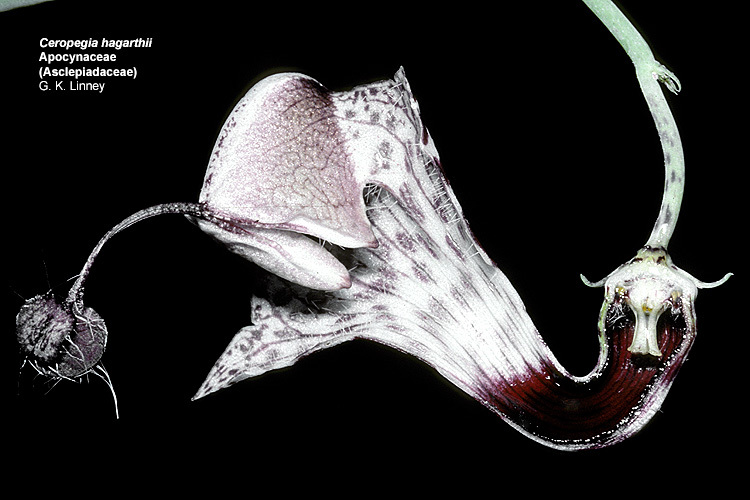 The flowers are bisexual, nearly always actinomorphic, and usually include an elaborate crown or corona of nectariferous appendages between the corolla and sexual parts. 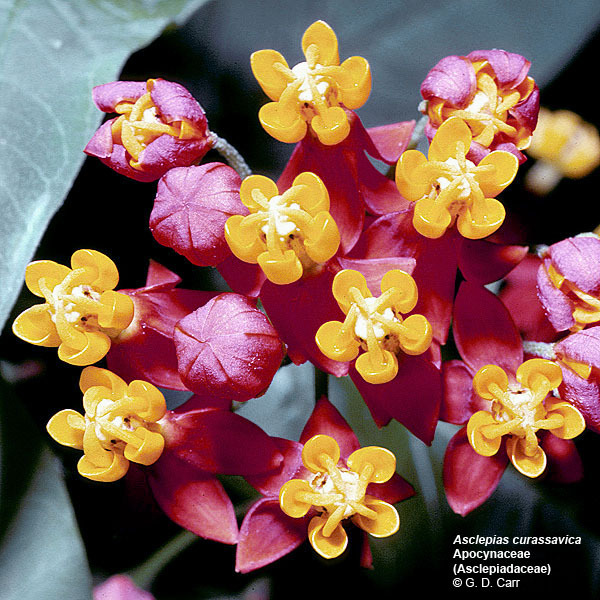 The calyx consists of 5 distinct or basally connate sepals. The inner perianth is a 5-lobed sympetalous corolla. 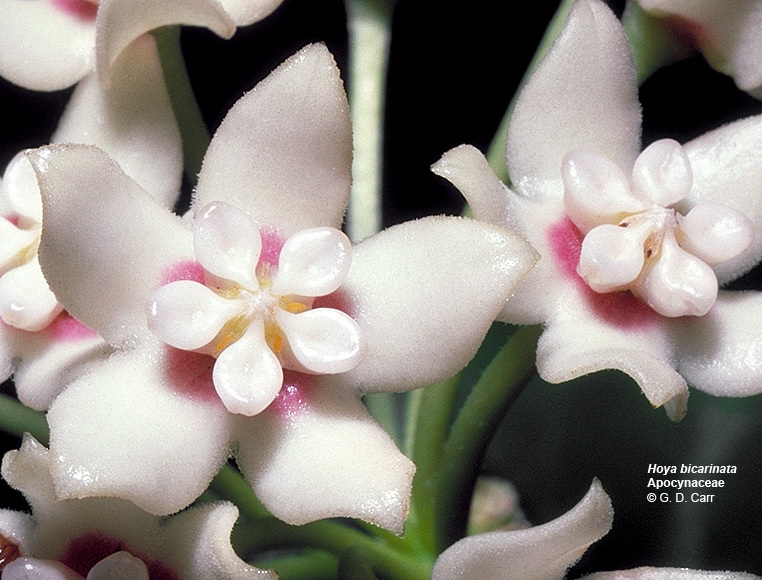 The androecium and gynoecium are nearly always adnate into a gynostegium with five highly modified stamens and a massive, 5-lobed stigma. The anthers usually produce paired sacs of pollen called pollinia that are transferred as a unit during pollination. 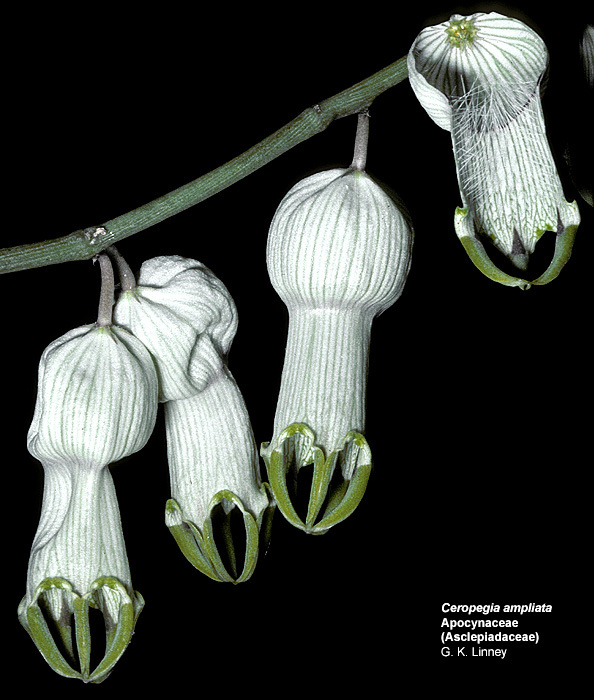 The gynoecium consists of a single compound pistil of two nearly distinct carpels that are separate at the level of the ovaries and styles and are united only by a single massive stigma. The ovaries are distinct, nearly always superior, and each has a single locule with numerous marginal ovules. The fruit is a follicle. 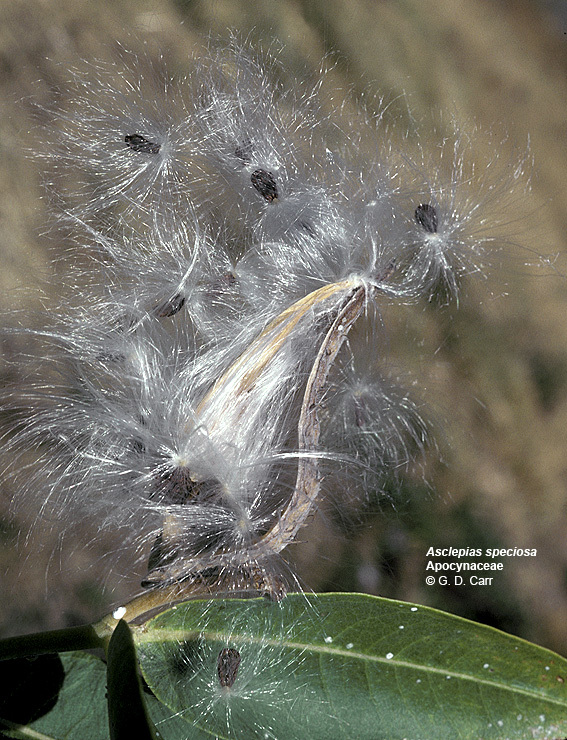 Seeds usually have a tuft of hairs at one end. 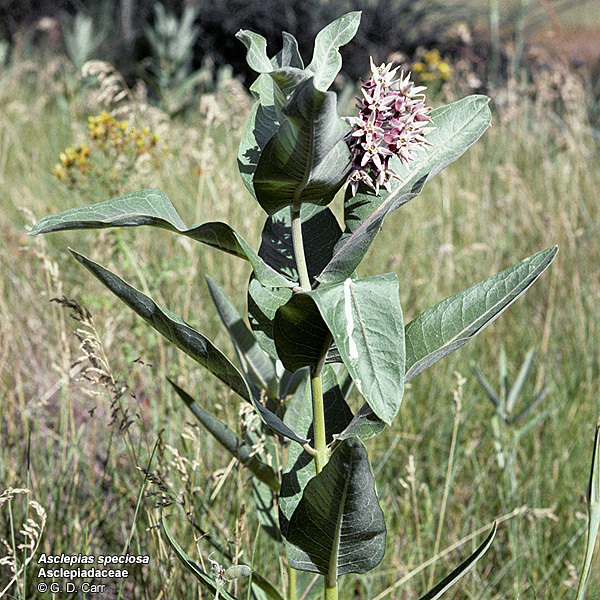 Asclepias speciosa, milk weed. Note opposite leaves and copious white sap seeping from damaged leaf. These are typical flowers for the family. Note the reddish reflexed corolla lobes. 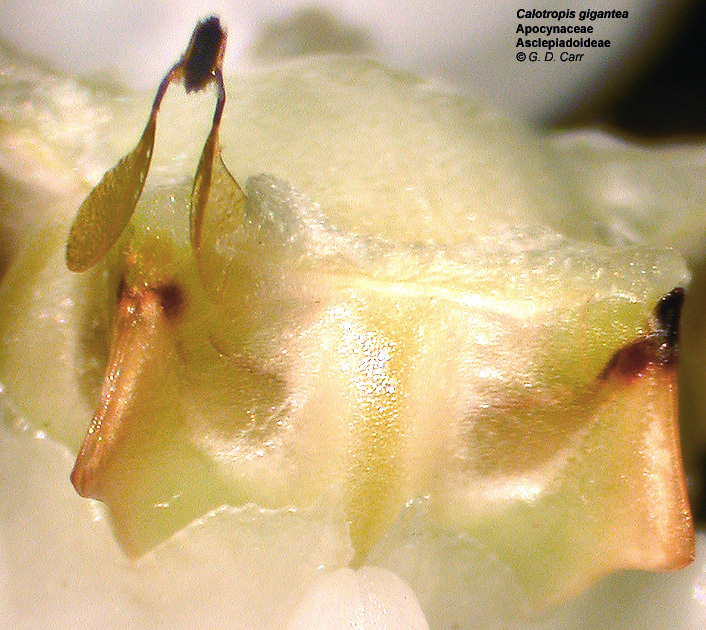 The very tips of 2 or 3 sepals are scarcely visible between corolla lobes. Just above the short corolla tube is the whorl of hooded and horned appendages that make up the corona. 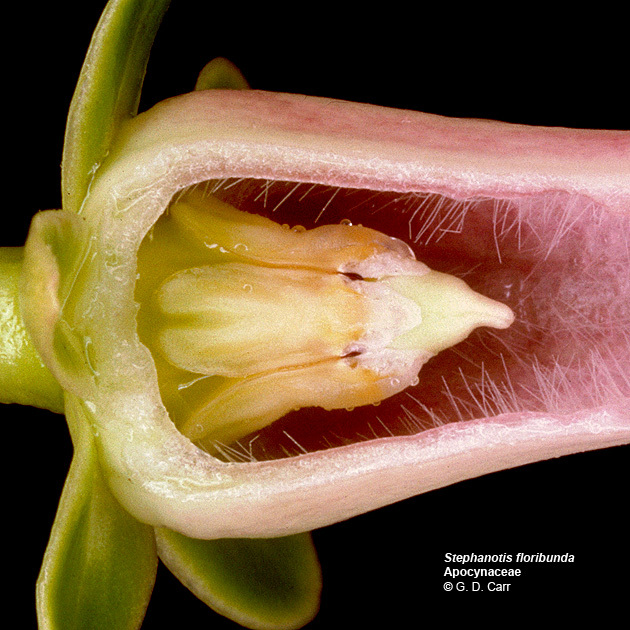 The green and pink gynostegium is in the center of the flower. 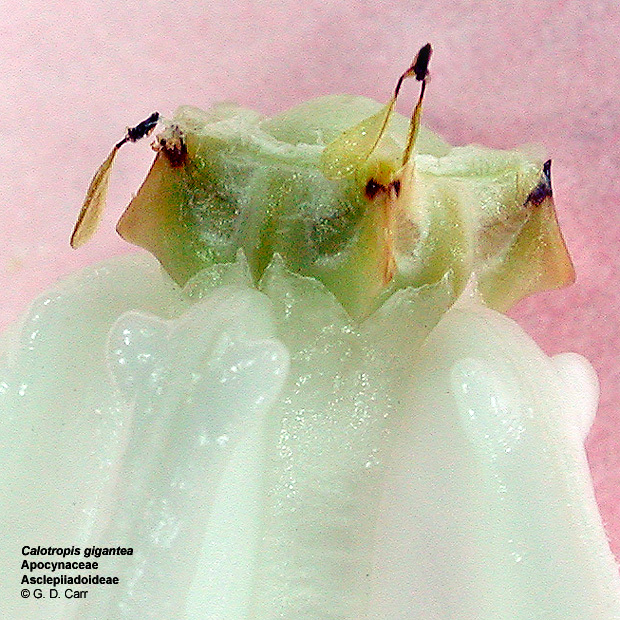 One of the five grooves of the gynostegium in the central flower is clearly visible. 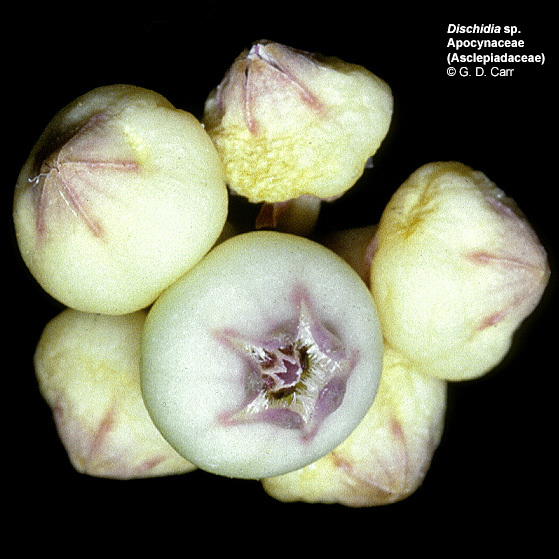 The pair of pollen sacs and the connecting gland that was present in this area of the gynostegium has been removed by a visiting insect. The gland would have been directly above the groove and it would have been attached to one pollen sac in each of the depressions visible on each side and slightly above the groove. The gland in the next counterclockwise position is still in place and is barely visible on the right side of the tip of the lower right coronal horn. 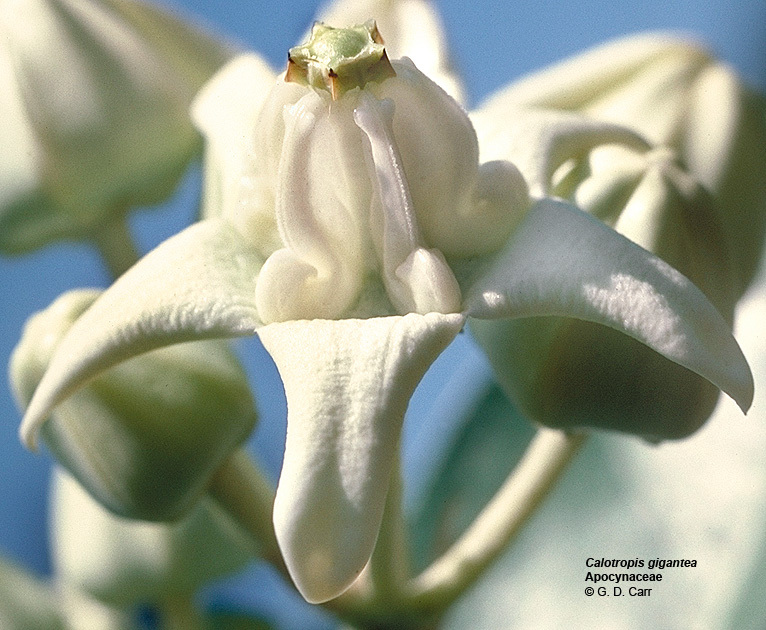 Calotropis gigantea, crown flower. The "crown" of this flower is used in leis. The dark gland at each of the 5 points around the massive stigma is attached to two pollen sacs, one from each of two adjacent anthers. 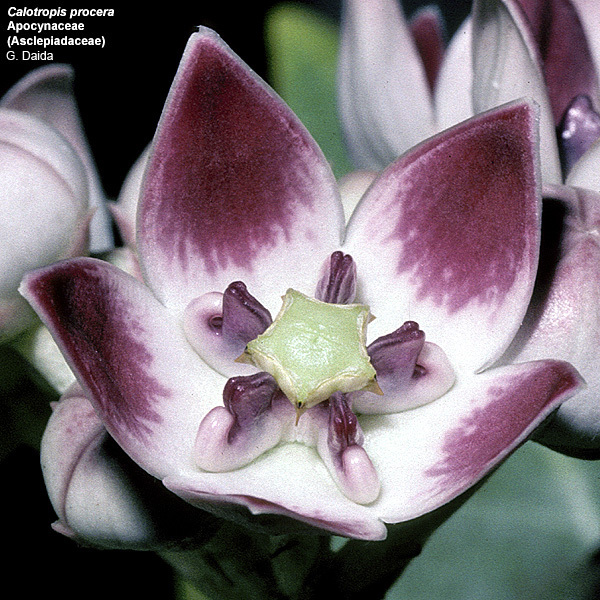 Calotropis procera, small crown flower. 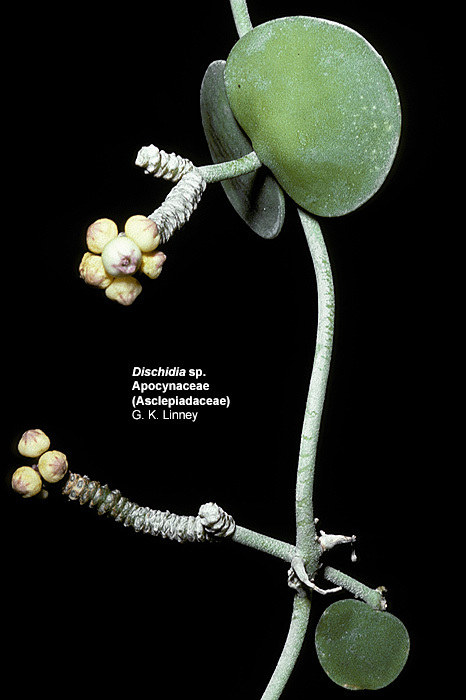 Ceropegia ampliata. Note orientation of hairs in the perianth tube that would make it difficult for insects to crawl out of the chamber once they enter. Ceropegia haygarthii. Zygomorphic flowers such are this are rare in the family. The corolla on this one has been sectioned to reveal the gynostegium deep inside the tube. 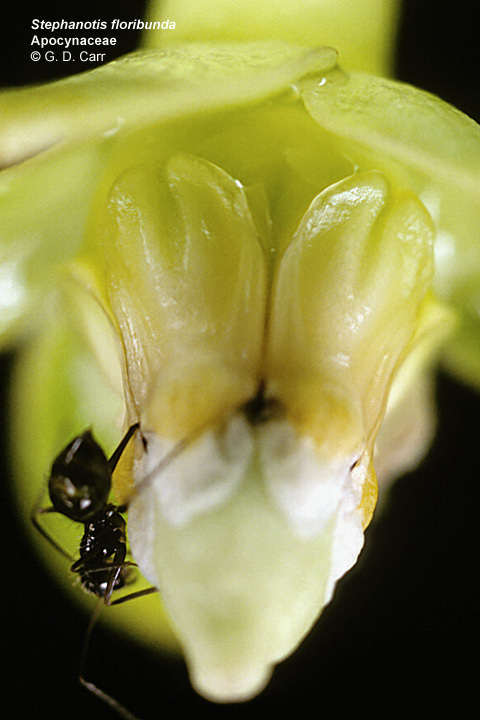 The pollination syndrome in this case includes trapping the visiting insect for a period of time. Note the milky sap oozing from the cut surfaces. 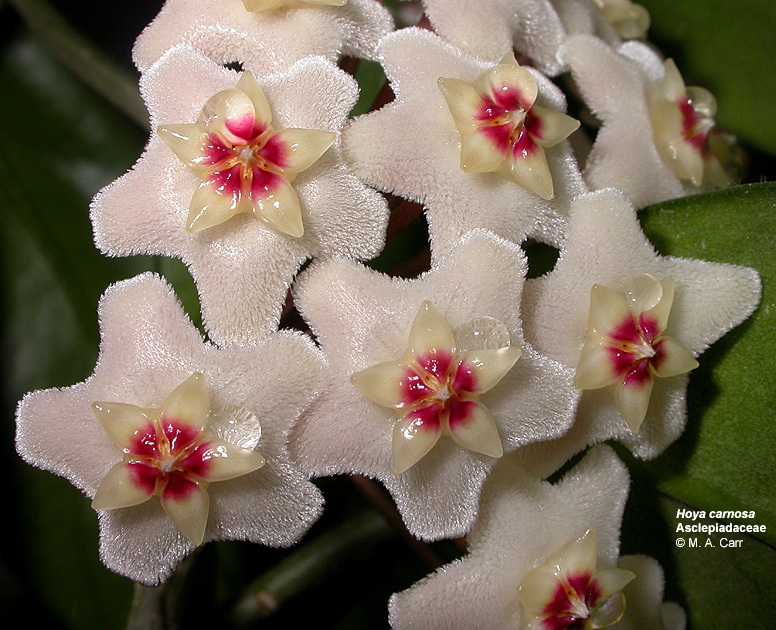 Hoya bicarinata, wax plant, pua-hoku-hihi. Vine from S. China with roots appearing along the stems. Leaves shiny, thick; flowers in clusters at leaf axils, fragrant, waxy, used for leis. 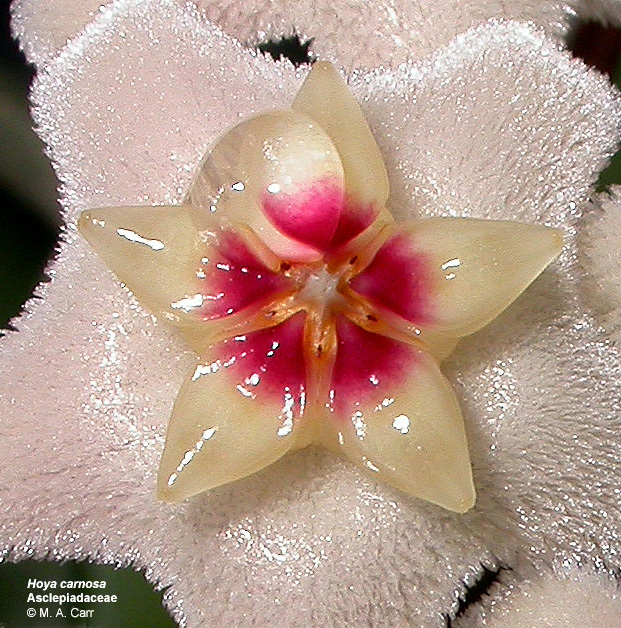 Hoya carnosa, wax flower. 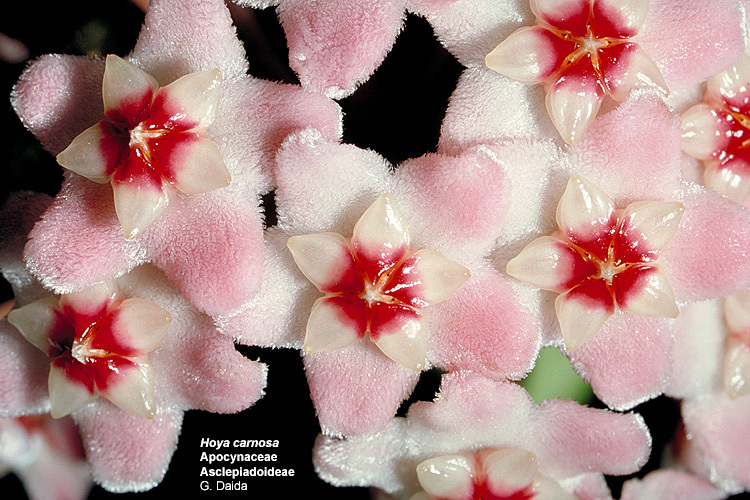 In this species the corollas are fuzzy and the waxy coronas partially obscure the gynostegium. 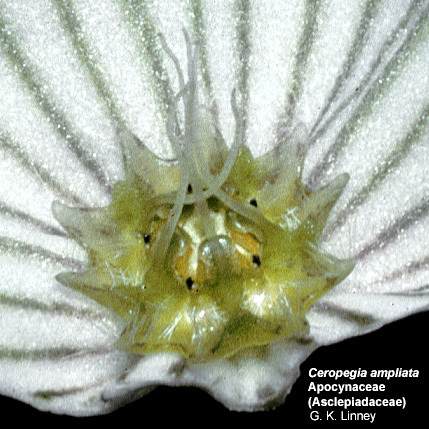 The glands connecting adjacent pollen sacs are visible as tiny dark specks in the grooves between the coronal appendages. 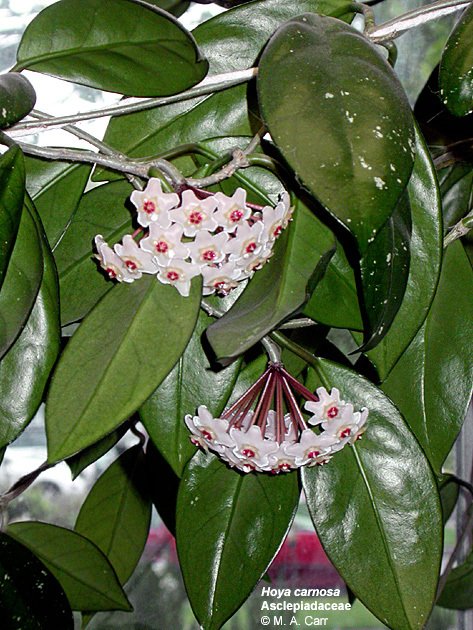 Stephanotis floribunda. 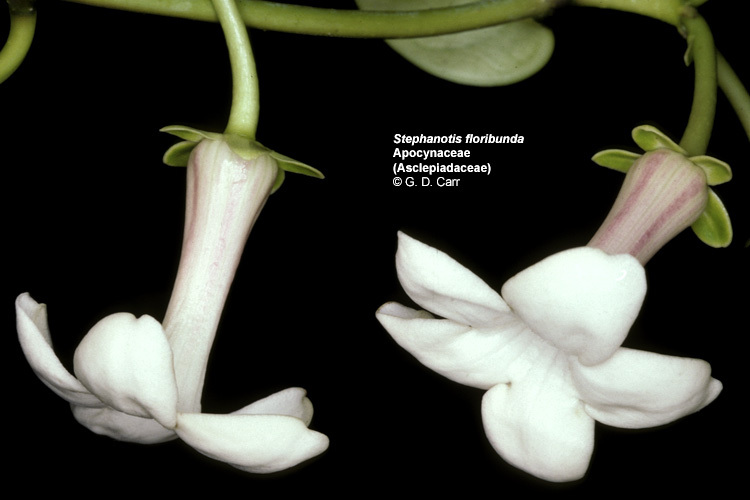 This sweetly scented vine has tubular flowers that hide the gynostegium. It may be seen in the cut-away view in the second photo. The ant in the third photo is "trapped" on the gynostegium; one leg is stuck in each of two of the grooves. It is apparently not strong enough to free itself by dislodging the pollinia attached to the glands at the narrow end of the grooves.